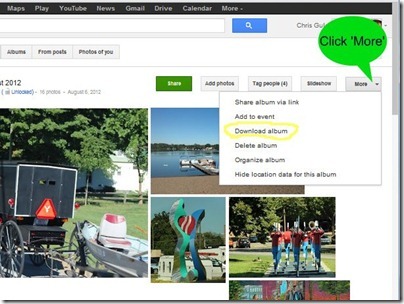 Picasa Tip: Yes you can Download an Album from Google+ Photos! – Learn Picasa and Google Photos! You don’t have an ‘album,’ with captions and ordering of google+. You just have the photos. To have an album, you then have to order them as they were in google+ and rewite all the captions you added in google+. Painful! It would be very easy to do better with some options in the download. I followed your video instructions and the album did copy to downloaded files, but when I viewed the photos I the doc they were out of order. I want to be able to use them in a digital photo frame in the order they appeared in the album. Is there a solution? I have spent numerous hours on something that should be simple to do. I would appreciate any help you can give me. I would hate to start from scratch.